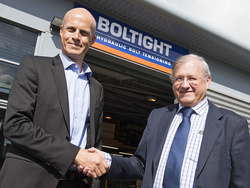 Boltight Limited, the specialist hydraulic bolt tensioning company, has today been acquired by Nord-Lock Group (Sweden), a world leader in bolt securing systems. Picture shows Ola Ringdahl, CEO of the Nord-Lock Group (left) and Fred Heaton, Managing Director of Boltight shortly after announcing the acquisition. Boltight's Directors will continue to manage the company, which was founded in 1999, from its UK base in Walsall in the West Midlands. The acquisition brings together a number of unique technologies, which will benefit customers in a multitude of markets and geographies. Utilising the combined distribution outlets now available within the Group, each company will be able to grow and develop more quickly and offer enhanced support on a worldwide stage. Boltight's hydraulic bolt tensioning systems have a global reputation for innovation and quality. The company's products are in use all over the world for demanding applications in the oil and gas, power generation, wind energy, industrial engineering, construction and mining industries. The Nord-Lock Group specialises in bolt securing and bolt tensioning systems. The combined strength of Nord-Lock's wedge locking washers, its Superbolt mechanical tensioning systems and Boltight's innovative hydraulic bolt tensioning systems, creates a powerful and market leading proposition in the increasingly important area of secure bolting solutions.